Two senior ASC personnel have been recognised for their outstanding professionalism, dedication and contribution to Australia’s Defence and industry capabilities, namely the Royal Australian Navy’s Collins Class submarines. The awards to general manager of engineering Jim Burnside and manager for operational period maintenance Tim Hill were announced by Defence Industry Minister Linda Reynolds. ASC chief executive Stuart Whiley paid tribute to the awardees, saying, "Jim and Tim are great representatives of our sovereign submarine workforce, numbering at more than 1,200 in South Australia and Western Australia." 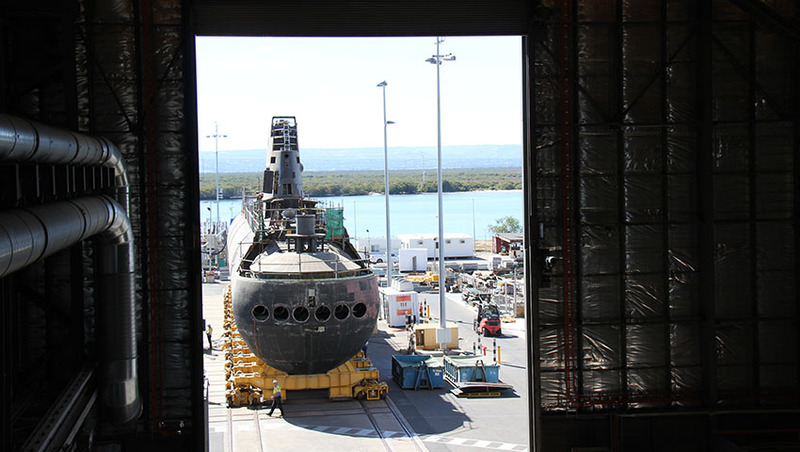 "Their achievements show the exciting range of professional challenges being met by ASC’s personnel and looks forward to continuing improvements in coming years, as we ramp-up to meet Australia’s expanding submarine capability requirements," Whiley added. Addressing the awards, Whiley said Burnside was a key driving force for ASC’s successful innovation program following the Coles review in 2012, which achieved international benchmarks in submarine deep maintenance, or full-cycle dockings (FCDs), in Osborne, South Australia. "Jim has been a key driver in establishing, on a program management and engineering level, an ambitious timeline in transitioning to a two-year full-cycle docking, down from at least three years. Jim proved that a faster and more ambitious time frame was achievable – moving to the ambitious new time frame within a single, two-year, FCD," Whiley said. Burnside said, "I am extremely honoured to be awarded the Defence Industry Service Commendation by Minister Reynolds. It is recognition of the work done by many people in the submarine enterprise from Navy, CASG, ASC, and industry partners, in transforming the Collins Class sustainment program to meet and exceed international performance benchmarks." Whiley said Hill, based at ASC’s maintenance base in Henderson, WA, was a key manager of ASC’s response to platform issues that arise with operational Collins Class submarines. "Tim is regarded by managers and colleagues alike as highly dedicated and skilled, with a ‘can-do’ approach across several decades of service that has seen him advance from the shop floor to a position that is a critical role for ASC and RAN in keeping Australia’s submarines available for operations," Whiley added. Responding to the award, Hill said, "I am surprised but very pleased to get this award. I am very appreciative of the teams, including the other submarine enterprise partners, that have supported me in this. I am also very grateful of the support and respect that has been shown from the Navy to my team. I get a lot of satisfaction from keeping the submarines at sea, and the camaraderie of the ships’ companies in Australia and overseas." The Defence Industry Service Commendations were announced in August last year and are "awarded to individuals or teams who demonstrate superior achievement or devotion in the application of skills, judgement, innovation or dedication to duty in Australian defence industry for the benefit of Australia’s defence capability". ASC Group is Australia’s largest locally owned defence prime contractor, employing more than 2,000 personnel engaged in Australian submarine maintenance, upgrade and sustainment and as shipbuilder for Australia’s Air Warfare Destroyer and Offshore Patrol Vessel programs.